>> The guitar chord you are about to hear is from the video clip for Morrissey's "The First Of The Gang To Die" posted below. Go down and hit pause now so as not to get startled. >> This very brief item at Pun Canoes about a forthcoming tour from Detroit garage rockers The Von Bondies reminded us of SSM, as the latter act is supporting the former on a slate of dates next month. SSM's self-titled 2006 set had a couple very strong tracks, and every time "The Seer" or "The Fourth" rises to the top during a shuffle of the IPod we always look up with a raised eyebrow to wonder, hey, who's that rocking us so steadfastly? The latter track is particularly bracing, a real scritchy screamer with a Leslie cabinet effect on the vocal. We've posted an MP3 below. A quick trip to the SSM web hutch reveals that the organ/guitar/drums trio, whose component members' first letters of their last names provide the initials by which the band is known, is about to release its sophomore full length, Break Your Arm For Evolution. The same site is hosting a preview MP3 for the tune "Start Dancing", whose ID3 tag indicates the track is actually titled "Don't Stop Dancing." An odd coincidence, as you may recall the Bob Mould track we wrote about on Tuesday was also mislabeled -- get on the stick, content people! Anyway, the new SSM tune is an altogether odd, key-jumping track that doesn't necessarily "garage" or "rock" -- instead we get drum machines, synths and organ laying down a mid-tempo groove before the guitar and chorus arrive and try to smash through the door all at once like The Three Stooges. It's actually a really great song, so we're also posting that link below. And suddenly we're excited to hear Break Your Arm For Evolution, which arrives on Alive Records next month. 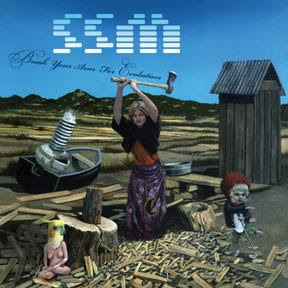 We reviewed SSM's self-titled set here last year. The tour with The Von Bondies is next month, and you can check out all the dates here. SSM plays Great Scott in Boston Jan. 22. >> This irritatingly upper-cased RCRD LBL thing is really taking off. Or at least they seem to have announcements everyday about exclusives with one band or another. And finally they've announced one with a band we like. Yesterday Brooklyn-based nu-gazers Dirty On Purpose disclosed they would issue for free download Dec. 11 via RCRDLBL.com the single "Leaving." The quartet said it would release an additional three singles through the site. In other Dirty On Purpose news, the band will issue its long awaited Like Bees EP Jan. 15, and the digital version will come with bonus tracks. If one takes all of this news in sum, it sort of makes one wonder why -- if the band had all this material -- they didn't issue a full-length record. We reviewed Dirty On Purpose's most recent Cambridge show at the Middle East Rock Club here in October. >> Alt-music icon Morrissey is pretty high up on our list of performers we've never seen that we'd like to see before we get too old to want to see anything. The fact that he plays venues that are substantially larger than the kind of rinky-dink rooms we prefer doesn't help our cause. But this video clip below that was Forkcasted recently just reminded us that we should probably pay attention to those 2008 Morrissey dates. Here it is below, Moz belting out "The First Of The Gang To Die."